Joe Derrane electrified the world of Irish music back in the late 1940s when as a high school senior he recorded eight solo 78-rpm shellac discs for Boston’s Copley Records on the D/C# two-row button accordion. Through his recordings and performances, this native Bostonian defined the state of the art in Irish-American button accordion playing. 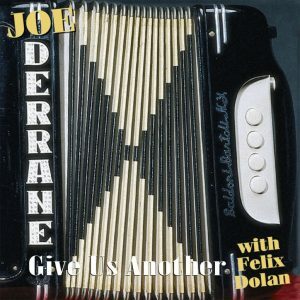 The Boston-born son of Irish immigrants, Joe Derrane is among the finest button accordionists in the history of Celtic music. He is also a somewhat elusive legend in the genre. After recording during the 1940s and ‘50s, he disappeared from the traditional music circuit for thirty-five years, popping up again in 1994 at the Irish Folk Festival at Wolf Trap. Since his career’s resurgence he has proved wrong F. Scott Fitzgerald’s famous quote “there are no second acts in American lives”. Over the past 16 years, Derrane has written 22 tunes and his current writing and recorded output is the most imaginative and inventive of his career. In 2004 Derrane received one of the highest honors for a traditional musician: the National Endowment for the Arts’ National Heritage Fellowship.